Students completing a BS.BUS with a concentration in Accounting are prepared to pursue careers as corporate, not-for-profit, or small business accountants or to continue their studies at the graduate level. 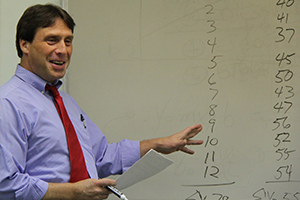 With the addition of the Master of Science in Accounting degree, students are prepared for careers in public accounting and advancement in private accounting. A career as a professional accountant requires a commitment to lifelong learning as the profession is continually evolving. Therefore, pre-entry education should lay the base on which lifelong learning can be built. This base has three components: skills, knowledge, and professional orientation. Students completing a BS.BUS.ACC will demonstrate technical competency and professional knowledge in accounting theory, auditing, and individual income taxation. It is strongly recommended that all students majoring in Business Administration complete either MAT 2021 - Statistics I and MAT 2022 - Statistics II or MAT 2021 - Statistics I and MAT 1531 - Calculus I for the scientific and mathematical frame of reference to be adequately prepared for upper level business study. Castleton offers a one year Master of Science degree for students seeking licensure as a certified public accountant or continued career advancement in either corporate, not-for-profit, or government organizations. Castleton’s graduate catalog contains a more thorough discussion of the degree including course descriptions. Requirements for initial CPA licensure vary by state; students desiring initial licensure in states other than Vermont should review the requirements of that state.